1.Look at the forms. There are 9 forms of Phra Somdej Wat BangKhunPhrom: The first five forms are the same figures as that of Wat Rakhang. The other 4 forms are: Sen Dai, Than Khu, Sangkhati and Ok Krudh. 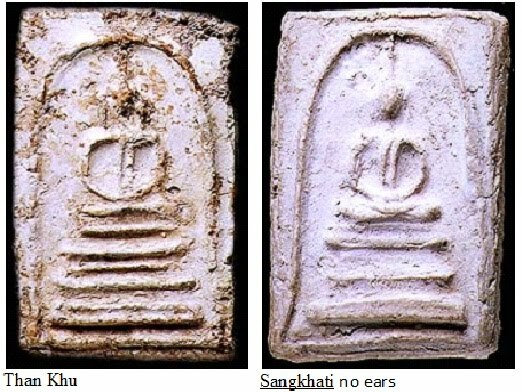 2.Have seen a genuine one before and compare it with other Phra Pim Somdej to spot the differences. 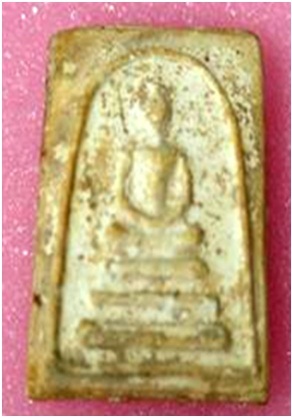 3.Look at the texture and the substance of Phra Somdej Wat BangKhunPhrom which are the same as that of Wat Rakhang. But the differences are the density of the substance and the holy maters are less than Wat Rakhang. The surface of Somdej Wat BangKhunPhrom always has the deposit of calcium, clay and ironoxide covered on it. 4.The arch of Phra Somdej Wat BangKhunPhrom is thinner than arch of Somdej Wat Rakhang. 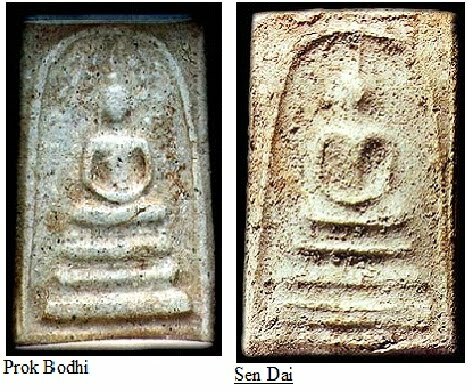 This is a rare Somdej blessed by Somdej PhraPhutdhacharn(Toh) and contained in the main Jedi of Wat Mai Amataros (BangKhunPhrom). This Somdej was officially excavated in B.E.2500 after a more than one hundred year of attrition that had brought upon on the Jedi. Broken Fragments of those damaged Somdej were used to re-produce another batch of Somdej in B.E.2509. People refer them as Somdej 09. As such, Somdej 09 are said to contain highest composition of Somdej PhraPhutdhacharn(Toh) holy powder. The consecration ceremony involves many Gurus that were still presence at that era. It is considered as one of the major consecrating ceremony in Thailand. Small portion of undamaged Somdej were distributed to committee members and the above is one of them, while the rest were put back into the re-renovated Jedi. This Somdej Phim Lek is very much smaller compared to those of what we have usually seen in any amulet website, magazine or gazette. Native Thais have further confirmed that Somdej PhraPhutdhacharn(Toh) did blessed and consecrated a small quantity of Somdej Phim Lek. The purpose may be for a tally of 100th standard size Somdej produced or specially make for the lady. We do not have answer for that. The back of Somdej shows the obvious trace of the harden soil even though it has been removed. 1) After containing in the Jedi of more than one hundred year, natural attrition leaves some marking for us to trace. Shrinkage trace of shallow concave edge is an identification point for both Wat RaKang and Wat BangKhunPhrom Somdej. 2) The original texture of Somdej BangKhunPhrom is white. The back of the Somdej shows an inner white strong lime substance. 1) Identify the Phim – look at the form, for the above, it is Phim Sangkhati. Although after the remove of the deposition of Calcium, Clay and Iron Oxide that used to appear on the surface on the Somdej. The form can still be easily seen. 2) Look at the Texture – substance of Phra Somdej Wat BangKhunPhrom is very similar to Phra Somdej Wat RaKang, the difference is the density of the substance. Phra Somdej Wat BangKhunPhrom has lesser holy materials. As such, the surface will have lesser protruded holy substances. 3) The arch of Phra Somdej Wat BangKhunPhrom is much thinner when compared to Phra Somdej Wat RaKang. 4) The inner strong lime substance. Fake Phra Somdej Wat BangKhunPhrom do not have that. 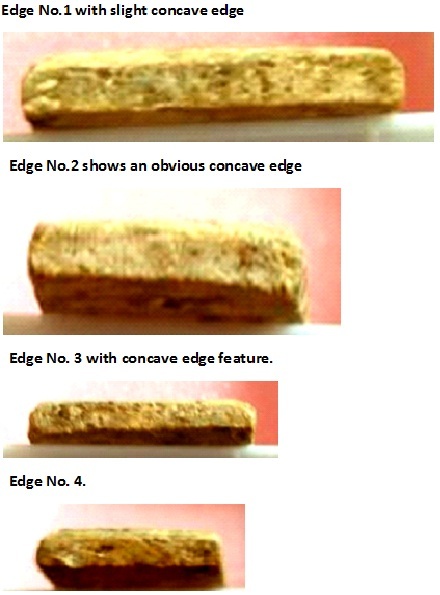 5) The shrinkage trace of shallow concave edge. 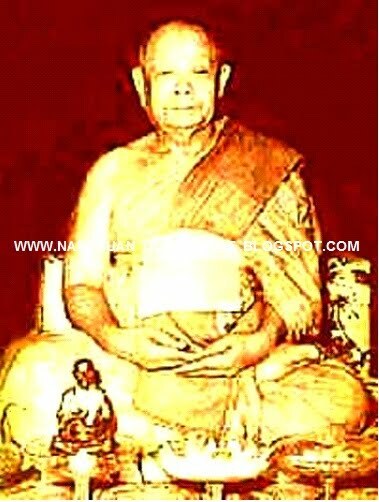 Luang Pho Nak was born on 1st August 1884 in Nakhon Ratchasima province. He was ordained at the age of 21 at Wat Rakhang. Well known for his efficacous somdej amulets having studied ancient texts and manuscripts, in particular LP Toh’s magic book. Luang Phor Nak was born on August 1st, B.E.2427, to the family of Mr.Pom Marurngsit and Mrs.Suan Marurngsit, locals of Nakonrachsima Province. He was ordained a novice when he was a young teenager at Wat Bung, Nakonrachsima Province. In B.E.2448, he was officially ordained a Buddhist monk at Wat Rakhang Kositaram, Bangkok, aged 21. Since then Luang Phor Nak has dedicated his life to serve the temple and all Buddhists. One important deed that is often associated with Luang Phor Nak whilst at the temple, was that he used to collect all the discarded sacred objects. This simple action was to become increasingly more important as the years went by. The general Thai belief at that time was any sacred objects that had become damaged, such as shrines, amulets, water bowls etc should not be kept at home, for the fear of bringing bad luck. 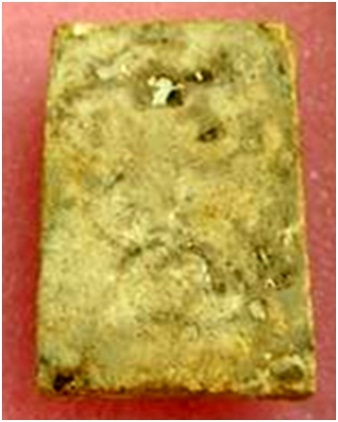 These objects would often be returned to the temple. Luang Phor Nak did not like to see these kinds of scared objects mixed with the general trash, and as such he used to collect and preserve in his monks house. He also did not want to see sacred amulets that had been damaged, destroyed needlessly. He decided to recycle this raw material to create new amulets. It was his belief that every single atom of the old amulets had been infused with sacred power, broken or not. Essentially these materials having already been blessed by some of the greatest living monks were priceless. Obviously we know today, that he was right, and are grateful for his foresight. 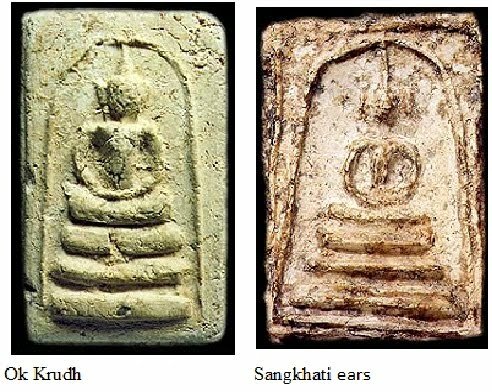 As the disciple of Somdej Phra Buddhacharn Toh, it is no surprise that his newly created amulets followed the procedures exactly as laid down by this great monk. 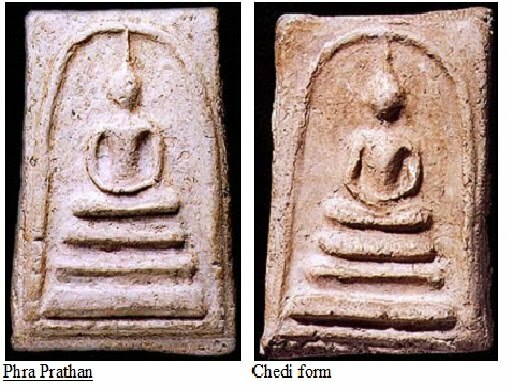 Incidentally some people have said that Luang Phor Nak was not a disciple of Phra Buddhacharn Toh, as he was not even born when the great monk had died. This is simply not an accurate assessment. Knowledge is passed from generation to generation and LP Nak studied ancient texts and manuscripts, in particular LP Toh’s magic book, and as such is known as a true disciple. Particularly famous and very popular are his amulets created during the period BE 2485- BE2495. Prices have increased sharply in recent years, and will continue to do so. These amulets are not only popular in Thailand, but worldwide, many people having experienced the sacred power and protection that these amulets afford. 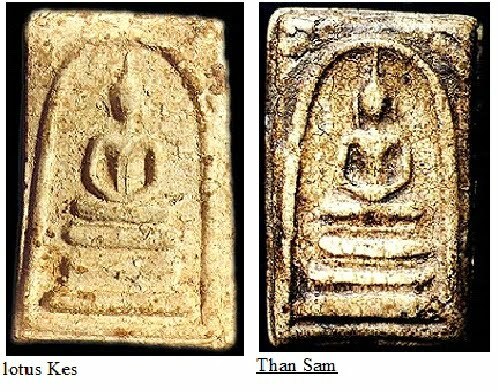 Many people have made a comparison between these amulets and the original Phra Somdej Bangkhunprom amulets, some of the most sacred in Thai history. Such is the popularity; these amulets are fast disappearing from the markets. We would highly recommend that you preserve any examples that you may possess. These amulets can be considered real treasures, which in the future only the wealthy will be able to afford. Just a word of caution; As a result of the increased popularity and high demand, many fakes are flooding the market. Be sure to only purchase from recognized dealers.